[NL]Holiday GigaLems 2016 "The Harsh Winter" - Yay another post holiday release! 60 more levels in a pack, that you must get through to save christmas! "Ironclad Peaks" What's this? a new tileset that doesn't look like it was made by a total newbie, Yep I made a new tileset all by myself (kinda) It comes with the pack for you to use. Re: Holiday GigaLems 2016 "The Harsh Winter" - Yay another post holiday release! Will play it in the future, but right now I've got a lot of university stuff and other things to do. Be honest GigaLem, do you think this pack is too hard for me or would I have a chance at finishing it. ObtainObject loop on "crystal_md:0". Please report this. 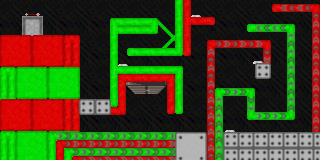 Then it seems that it's ~ the same bug that happens with möbius contest level "Slaughterhouse". 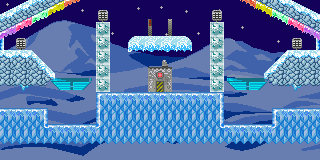 crystal_md is one of the Genesis variants of the default tilesets. Most likely, Nepster does not have a copy of this tileset, and does not have graphic set auto-downloading enabled (as this is an autodownloadable one). If this guess is correct, immediate solution is to either turn that option on, or to manually download crystal_md (either via browser or using the Download menu in the editor or Flexi) and place it in the "styles" folder. Longer-term solution, GigaLem should include in his NXPs any graphic sets that aren't built into NL itself, even if they're auto-downloadable. This means any graphic set that isn't from L1, ONML, L2, L3 or the Lemmings Plus series, except for Xmas, Sega and Horror. Okay, this doesn't make sense, upon inspecting the NXP's contents there is a copy of crystal_md in there, so the presence or lack thereof of crystal_md in the styles folder should not matter. There have also been reports that this pack does not load properly on (privately released) experimentals for new NL versions. While I've yet to properly investigate (I'm about to do so now), I suspect that this is due to GigaLem preferring to manually overwrite the default Lemming sprites with the Xmas ones, rather than simply selecting in Flexi Toolkit to use Xmas sprites on all levels and updating to the NeoLemmix version that fixes the bug where this option did not work. Second possibility is the use of actual custom spritesets that are lacking some animations, most likely the Fencer. Okay, I was close: The Xmas spriteset is indeed configured to be used (rather than overwriting the default one), but GigaLem has for some reason included a copy of them, with no Fencer graphic. One solution would be to add the "xmas_fencer.png", "xmas_fencer_mask.png" and updated "xmas_scheme.nxmi" files from the default graphics download. A better solution would be to remove the custom spriteset altogether, given that at least at a quick glance it doesn't appear to be any different from the normal versions of the Xmas sprites and as such there is no reason to include it in the NXP. Regarding the issue with the final level: This is weird, because upon inspecting the NXP's contents, it does include a copy of crystal_md. I also don't get any crash upon playing this level, also using V10.12.12-C.
a) I already had the "crystal_md" style in my style folder. Then I selected "Enable Online Options" and "Enable Update Check" and the error still occured. b) After selecting "Update Styles Automatically" NeoLemmix wanted to update the style "crystal_md". After doing so, the error vanished and the level loaded correctly. c) Now I got curious and deleted the style "crystal_md" again from the styles folder. Interestingly the level still loaded fine. d) Next I searched a bit for an outdated version of this style, found one and placed that into the styles folder. Surprisingly, everything still worked fine. e) Finally I downloaded the NeoLemmix player again and placed it in some completely new directory and added a new copy of GigaLem's pack there. Again everything worked as desired with no error at all. Is it possible the version you had prior to this wasn't just out of date, but corrupted somehow? That's a possibility, but I don't play around with graphic styles, so I really wonder what could have corrupted a style file? And unfortunately the old style file got overwritten by the update tool, so I can't check and confirm whether this was the cause.